There has been a lot of buzz generated since yesterday's article in the Wall Street Journal about the explosive growth in the SNAP, formerly food stamps, program. Now the Daily Beast has weighed in with a story by David Frum "Are Food Stamps Becoming a De Facto Guaranteed Minimum Income?" Like the WSJ article it discusses the effect of changing income and asset tests on caseload growth. EBT professionals talk among themselves about the advantages and scope of EBT. But it's nice to the work we've all done recognized by "civilians." The Fort Mill Times has a nice article on the advantages that electronic government payments, including EBT, bring to cardholders. The article recounts a recent study by the Center for Financial Services Innovation and Hudson Institute, "Double Duty: Payments Cards as a Doorway to Greater Financial Health." And you can read the article by clicking here. Today marks a landmark in electronic government payments. As of today, March 1, the U.S. Treasury will no longer make recurring check payments to consumers by way of those ubiquitous green checks. As of today the Treasury will only make recurring federal payments for programs like social security electronically. Consumers have the option of receiving their payments either by direct deposit or by a Direct Express card issued for that purpose. There is a good explanation of the change in the Payment Trends portion of the Electronic Funds Transfer Association website. To access it, click here. If you've been in this business for longer than 12 years you remember the battle over ill-fated EFT 99 program. The Debt Collection Improvement Act of 1996 mandated that all federal payment with the exception of income tax refunds were to be made electronically by the end of the decade. By 1998 Treasury, which dubbed the new program "EFT 99") had published its final rule for how it was going to migrate millions of consumers to electronic payments. Congress, which had mandated the program, walked back it support for mandatory electronic payments in the face of withering opposition from consumer groups. Treasury announced that federal check recipients without bank accounts would receive a waiver from the electronic requirement until Treasury could develop specifications for the EFT 99 card account, which it called the Electronic Transaction Account, or ETA. The program, which according to the final rules was supposed to be mandatory, suddenly became voluntary. Then the program got caught up in millennium politics. What was then called the General Accounting Office was required to weigh in on whether it thought EFT 99 would impact the government's Y2K remediation efforts. The program languished. By 2002 the Treasury was still disbursing a quarter of payments (excluding tax refunds) via check. That year the House Financial Services Committee's Subcommittee on Oversight and Investigations asked the GAO to look into the issue of electronic payments. The results were not pretty. GAO concluded that the "ETA has not been widely accepted by banks or unbanked beneficiaries, despite Treasury's efforts to promote it. Since the initiation of the program in 1999 36,000 ETAs have been opened, representing fewer than 1 percent of unbanked beneficiaries..."
Despite the Herculean effort by Treasury's Financial Management Service, the ETA had bombed with the public. The conclusion of the GAO report was the final blow: "Because less than 1 percent of potential unbanked federal beneficiaries have opened ETAs, it is uncertain whether the ETA will generate enough savings sufficient to offset the cost of maintaining and promoting the program." In other words, a program designed to save the government money was hemorrhaging cash. The program was shuttered shortly thereafter. Fast forward to 2013. We mark today the end of a nearly 17 year effort to replace the costly, fraud-prone process of printing checks with the relatively more secure and more convenient process of government-sponsored prepaid cards. The mistake with EFT 99, which was in trouble from the start, was probably trying to legislate such a mandatory change in an election year. Treasury's current Direct Express program was born of an executive order and regulation and did not face the same obstacles. 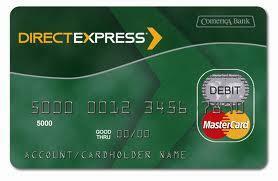 However, the rapid adoption of the Direct Express card is also a measure of how far we've come in our acceptance of electronic payments in 17 years. What once made for good theater in a series of Senate hearings is now largely forgotten. Government, in conjunction with the payments industry, continues to look at new technology for the delivery of payments. It's important for both to remember that technology acceptance isn't guaranteed. Whether it's EBT cards for the WIC program, new form factors like smart phones for transaction authorization, or mobile payments, there will be detractors, naysayers and members of the Flat Earth Society blocking the street. But Direct Express is only the latest in a payments migration that's taken us from barter to coinage to banknotes to checks to credit to debit to mobile and beyond. What lies behind here is anybody's guess. The certainty is that we'll get there. The uncertainty is when we'll get there. There have been some changes to the agenda for the April 10-11 eGPC meeting in Fairfax. To view the latest agenda and to register for the meeting go to http://www.efta.org/files/pdf/efta_issue_595.pdf.